I am a lover all of animals, but when it came to choosing a puppy I was so confused on which breed was right for me. I did endless online quizzes. While all puppies are ridiculously cute, I tend to go for medium and larger dog breeds. I’m just not a pooch in the purse type of girl. I need a snuggle buddy and a jogging buddy. I grew up with hearty life loving Labradors. My roommate had the sweetest Pitt Bull Jasmine, and I once had a pot belly Pug. My husband never grew up with animals and it was almost a breaking point when I found out he preferred cats over dogs! What would become of this relationship? He had a scary incident as a child with an dog attacking him. As much as I wanted to adopt a rescue dog, I knew our first one needed to be something he could raise as a puppy with a calm demeanor so he could bond with the rascal. I agreed we would get a kitten the same week as the pup. He wanted a Garfield kitty and I drove hours to find him one just a few weeks before our cockapoo was allowed to come home. It was the best decision ever. These two are in love with each other. They clean each other, play together, eat together, sleep together. It’s simply amazing! Didn’t shed or shed very little. After living with Labs and Pugs I knew I didn’t want hair everywhere. A medium sized dog that loves to snuggle and jog. A quiet dog no little yappers or howlers allowed. Family friendly for when that day comes. Not prone to anxiety home alone. White or light colored coat. 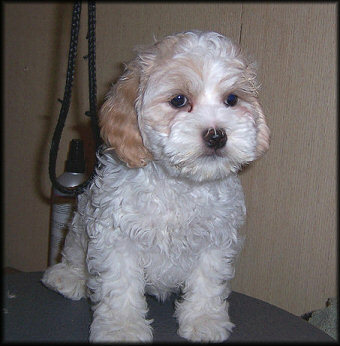 I fell in love with the Wheaton Terrior. I knew this was the dog for me. It looked like a giant teddy bear. But there is something in that face that is pure mischevious. Everytime I would meet a Wheaton on a walk I would ask the owner my normal questions. Do you love him? Is she hard to train? I’d always get the same answer, oh yes she’s cute, but she’s a “Wheaten.” They are known to be slightly less orniery than typical terriers, but they are jumpers, stubborn, and get hyper. My friend who had Airedales her whole life reassured me I don’t want a terrier. That’s when I came across forums saying they were Wheaten Terrors. That’s when my Wheaten bubble burst. What was I getting myself into?! But something was missing. Then I came across a classic hybrid the Cockapoo or as others would call it a mutt. And I love my mutt! She is the perfect mix. Cockerspaniels alone can get grumpy and snappy as they get older. Poodles seemed either too large or too small, and maybe too smart for their own good. 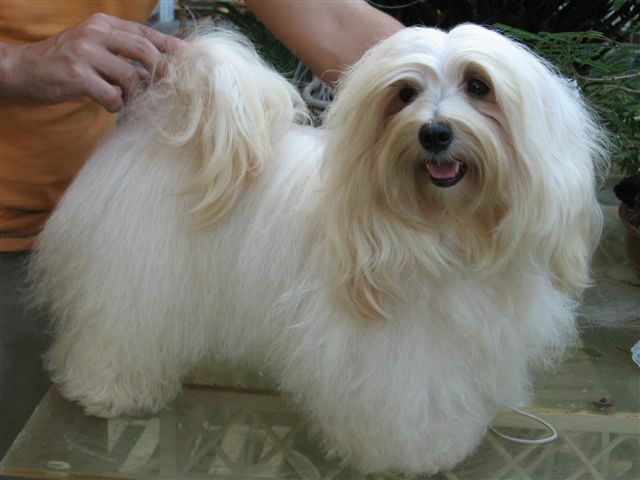 They are also very energetic and need lots of grooming on a regular basis. These two breeds together was the perfect match for what we were looking for in a dog. Now every breed and dog personality is different, and training does affect how the dog grows up, but in general I love this breed! 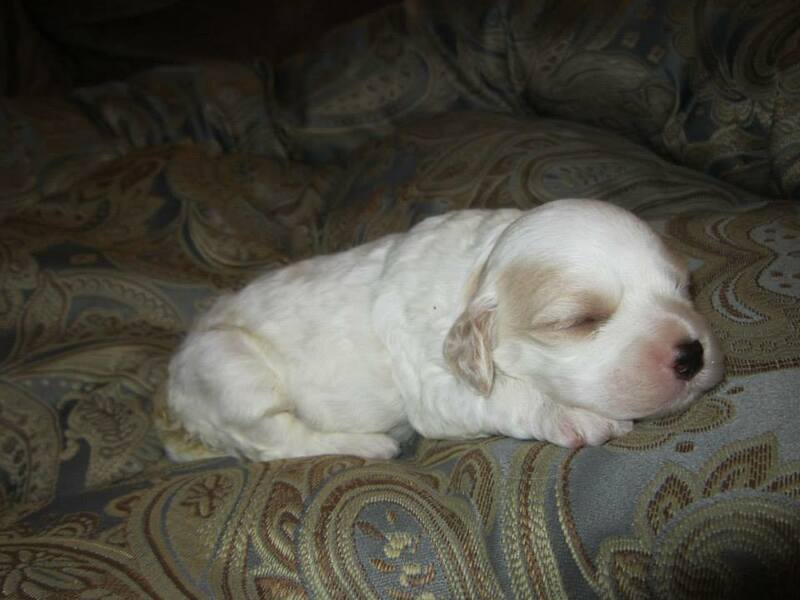 I had the first pick of the litter and we wanted a white female. She was the last of 8 pups to be born, which were all black males. She was the runt so she is very submissive yet loving. Cockapoos can range between 15-30 pounds depending on their parents genetics. She was a cross of a first generation working cockerspaniel and a cockapooo (min poodle and english cocker) Her one year checkup weight was a whole 17 pounds so she is on the smaller side. At first I wanted her to get taller and bigger, but after having her a puppy I was enjoying the small stage. She is the perfect size, a large small dog. She can be left alone for hours when I need to leave. Ever since she was a puppy we left her alone and didn’t crate her. Only recently did she start some chewing of a few things (pillows, shoes) but she is in her rebelous teenager phase. She loves to play and run. We have a fenced in acre yard she loves to patrol and romp around. She can easily run a few miles with me, yet in the house all she does is a little wrestling with the kitty, and tons of snuggles and sleeping. She is not a barker. When she needs to go out she waits by the door. If a stranger comes she will do a few barks, but she isn’t a typical yapper. She knows her basic commands. She even knows when it is bed time and goes to her room at 10pm to sleep. Potty training wasn’t too difficult. We brought her home in October then we had the worst winter. -10 F that lasted from November and snow until May. Thanks Canada. So the real potty training didn’t start until the spring, but now she goes outside on a regular basis and only does her “accidents” in one section in the basement, so I’m not complaining. Her hair, she doesn’t have fur, is so soft and silky. I don’t really comb it, but every few weeks I trim it with scissors and she loves her grooming time. I take her to the proper groomer twice a year for a good shave in the spring and fall. It’s normally $30 bucks each time for a wash, cut, and blow dry. She isn’t aggressive. Never say never, but I could never see her snapping or biting someone. She is independent, yet if I’m home will follow me to every room and nap near me. Her and the cat usually find time to snuggle together. I am all for saving rescue dogs. If you are able to adopt, volunteer, or donate, its a very noble thing to do because every dog deserves a loving home. 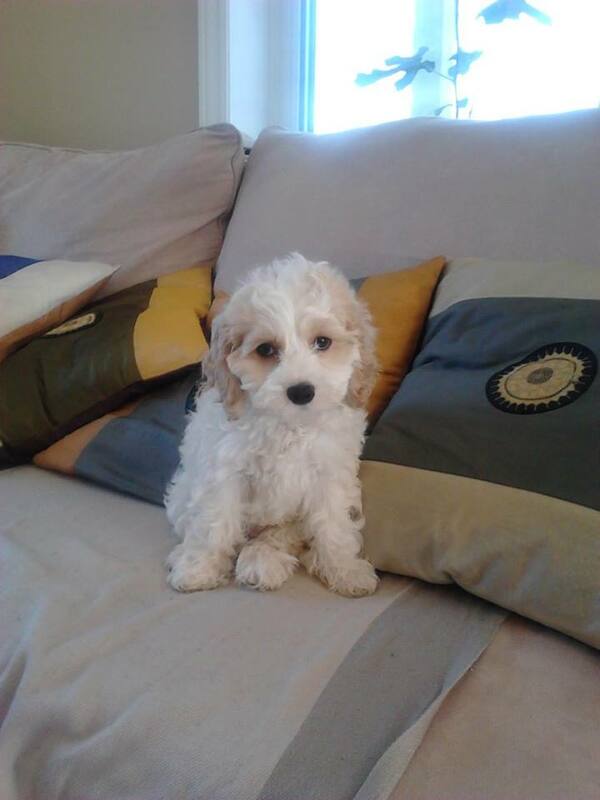 Now that I broke in my husband our next pooch will be a shelter dog, but if you need a hypoallergenic dog, I really do love mixing a cocker spaniel with a poodle. This is Zema at 12 weeks. She looks the same, oh those sad eyes lol, but is a bit taller and chubbier. Zema means winter in Russian. She is 20 inches nose to rump, 15 inches high and 17 pounds. She moans…a lot. When she stretches, sleeps, gets cozy, she’s a moaner. She loves eating cat food and playing with the cat’s toy mice. The cat on the other hand loves raw hides and balls. She is scared of toddlers, she thinks they are some sort of animal her size. She loves being loved and sleeping. 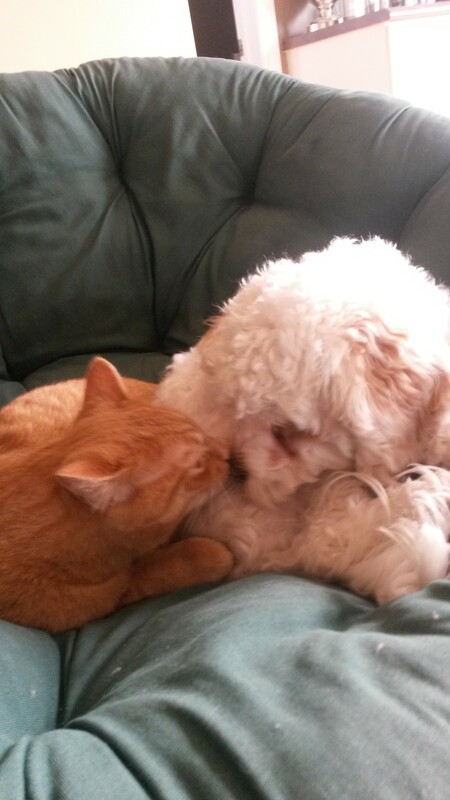 Posted on December 5, 2014 December 23, 2014 by emilyturner23Posted in TurnerTagged cockapoo, lovable mutts, non shedding breed, Zema.